The North Ridge Triple sags with the weight of full chairs, Sunday. 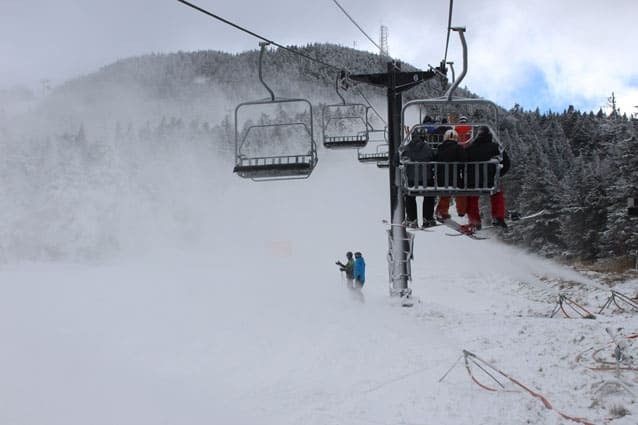 KILLINGTON – Killington Resort kicked off its 2015-16 winter season at 12 noon on Sunday, Oct. 18, becoming the first North American resort to open for skiing and snowboarding. The first turns of the season were dedicated exclusively to Season Pass and Express Card holders; the resort opened to the general public Monday, Oct. 19, at 9 a.m. Resort personnel said they plan to operate through the week starting at 9 a.m., weather permitting. However, they advise all visitors to check the conditions report for updates as it is early season, and things can change rapidly. On Sunday, the K-1 Express Gondola provided uploading and downloading to open terrain for skiers and snowboarders from 12-3 p.m. and the North Ridge Triple allowed uploading until 3:45 p.m. Skiers and snowboarders must use the Peak Walkway to access open terrain and return to the K-1 Express Gondola for the trip down to the base area. Early season conditions exist, and snowmaking and other on-mountain operations are often also in use throughout the day on open terrain. Skiing and snowboarding will be on advanced terrain only, providing roughly 600 vertical feet of open trails. Season Pass and Express Card holders were also invited to a free exclusive appreciation luncheon at K-1 Café on Sunday. In addition to skiing and snowboarding, the Killington Mountain Bike Park, Beast Mountain Coaster, Skyeride and scenic gondola rides still operated through Sunday as scheduled, offering multi-sport potential during peak foliage season.